Galician white wines have always been on our radar. 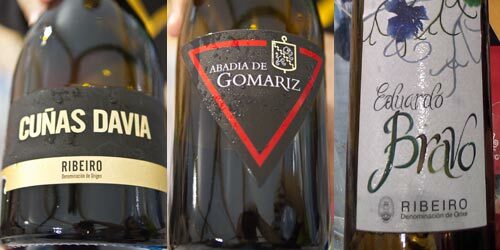 Regions like Rias Baixas are better known outside of Galicia, but the DO Ribeiro has gained a great deal in fame in recent years, especially for their unique Treixadura wines. So whenever the chance arises, we’ll take it to sample them. Over the last weekend in Barcelona was the “Mercat de Mercats” which is literally a fabulous “market of markets” fair that allowed local purveyors of all things delicious to show off what they had. In addition to the stalls set up in the cathedral square, there were also some events on the side like gastronomic shows and tastings. One that was very popular had a fishmonger breaking down a 170kg tuna in to filets (called, ronqueo) which was terrifying to watch mainly given the size of the damned fish. Another event was an overview tasting of wines from the DO Ribeiro which we made it to, barely as grup gsr, who were running the event were more interested in turning people away in favor of “invited guests” which ended up not showing up leaving them with a half full tasting room. While no end of lame, such things are pretty typical in Spain no matter the organizer, although some are indeed more difficult than others. Anyways, once seated, we were treated to a tasting of eight different wines from the region: six whites and two reds. They were decently tasty and inviting overall, but in general, they didn’t blow us away. Most of the wines were from the 2011 harvest and thus very young. And while unique and perfectly suitable for the table, they were lacking in punch and/or depth, making it feel like last year’s harvest had run afoul of bad weather. 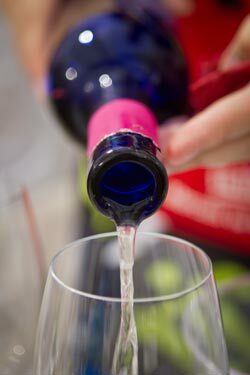 Some of the winemakers who were talking were rather reserved about some of the bottles as well, stating that they may need more time in the bottle. We were under the impression that Ribeiro was a young DO wine region, but apparently it is actually the oldest in Galicia and one of the oldest in Spain. We also learned that there are records of a Ribeiro wine being the first wine brought by Columbus to the Americas. These days there are over 100 wineries in Ribeiro, producing mainly whites with native grapes such as the aforementioned Treixadura, but also Torrontes, Albariño, Godello, Palomino, Loureiro, and a couple of others. While we ran through Terra do Castelo, Eduardo Bravo, Eloi Lorenzo, Casal de Armán, Valdavia, Coto de Gomariz, and Antonio Cajide Gulín, it was this bottle from Bodegas Cunqueiro that hit our palate in the most favorable of ways.